So far this year we've chaperoned Anna to six birthday parties. Six Saturdays. And while I'm grateful for parents who shell out to invite the entire preschool class I'm also holding up my white flag in surrender, because I'm just not cut out for this particular brand of chaos. 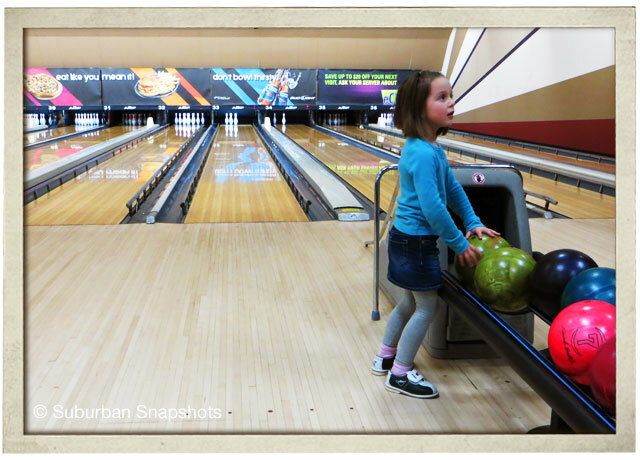 A couple of weeks ago Anna and I went to a classmate's bowling party. The kids LOVED it -- there was pizza, cake, unlimited opportunity to knock each other unconscious with candlepin balls and argue over the reset button. The lights were low and the disco ball spun and sparkled, the game room beeped and spat out prize tickets, and my daughter raced back and forth, abandoning dozens of tokens, half a slice of pizza and all but the frosting on her cake. I walked ten miles that day, from the lanes to the game room and back, standing guard outside the bathroom doors, bouncing from one token-eating machine to the next, eyeballing each exit door as an invitation for my daughter to disappear from the building. Despite her insistence that all I do is "chit-chat, chit-chat" with other moms, I had nothing but truncated conversations and shouted a few, "I SAID HAVE YOU SEEN ANNA!? "s as I whizzed past my friends. Guess who took the better nap once we got home? Not the kid eating a smuggled bag of claw machine Starburst, if you were wondering. Anna's birthday is coming up and we've been trying to figure out a plan. We can never depend on spring weather -- one year we had glorious sunshine, the next we had a scaled-down version of Tough Mudder. This year my mom offered to pay for a party at Chuck E. Cheese's to which I may have replied with unintelligible shouts and a dramatic buckling of the knees. I love my kid, I believe in super special birthdays, but I'd sooner convert us all to Jehovah's Witnesses. I prefer house parties; that's what I grew up with and as much work as it is to scrub the bathroom and feed a bunch of kids who hate everything but eat all your ranch dip with their fingers, it still comes in under $500 and feels more welcoming and intimate. These are the people in our life right now, this is not an obligatory list of guests we had to invite. The cake will be beautiful, but I'm not crafting place settings or handmade streamers. I will feed the adult guests as well as the children, and I'll do it well. Anna will get her first brand-new two-wheeler and a skateboard with the money we won't spend on singing animatrons and greasy pizza, and my house will be torn apart by enough guests to violate local fire codes. And even as I watch icing splatter on my floors and ceiling, and despite the inevitable arguments and injuries, I'll have more zen than I would trying to track one bouncing head among a sea of preschoolers trading in their 7,000 tickets for a measly bag of Skittles.